Beatrice (Valeria Bruni-Tedeschi) is a motor-mouthed fantasist, a self-styled billionaire countess who likes to believe she’s on intimate terms with world leaders. Donatella (Micaela Ramazotti) is a tattooed introvert, a fragile young woman locked in her own mystery. They are both patients at the Villa Biondi, a progressive but secure psychiatric clinic. They form an unpredictable and moving friendship as they flee the mental institution in search of love and happiness in the open-air nuthouse – the world of sane people. 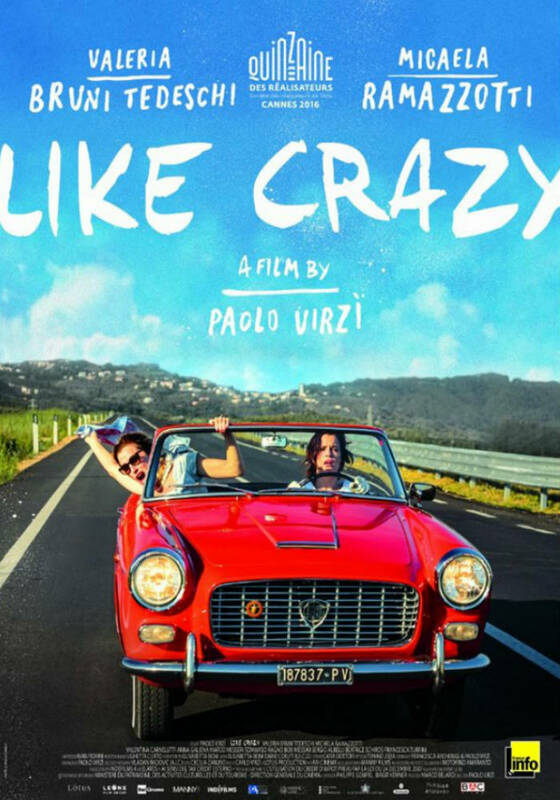 Like Crazy reminds me of that whimsical quip, ‘All the world is mad except thee and me … and I don’t know about thee …’ We are indeed all crazy in our own way, and it can be a fine line between some on the outside and some on the inside – as Paolo Virzi’s film suggests. Valeria Bruno-Tedesco as Beatrice and Micaela Ramazotti as Donatella are both terrific as two damaged women who were born depressed and then had depressing things happen to them, finding themselves at the best place for them, the psychiatric facility known as Villa Biondi. What’s great about Virzi’s vision of Villa Biondi is that it avoids the clichéd old version of such places, instead portraying the staff as genuinely caring and progressive in their attitudes, and the inmates are not grotesques. Nonetheless, Beatrice and Donatella – who arrives after Beatrice – are not happy to stay there. Beatrice is a wonderfully observed character who lives her fantasy life as if it were real, as it blends with reality … but is better. Bruno-Tedeschi makes her a magnificent, energy driven character, rollicking so high and fast she can hide her pain. She does audacious things to strangers as well as to those who know her, and her edgy behaviour gives the film a tension all its own. Ramazotti is a tragic figure, having been saved from drowning in catastrophic circumstances. She is denied access to her son and the father wants nothing to do with either of them. Frankly, though, he is not such a desirable character, but of course that’s not the point. The screenplay takes pains to develop the relationship between the two women, providing both drama and comedy along the way. They have a couple of adventures on the run, when their mischief is a source of self-reliance and a sense of freedom. But the anchor of their depression never completely vanishes, and that provides a rich undercurrent that plays against the often lighthearted surface. The screenplay explores the cruelty of the world through the prism of characters who are both victims of that cruelty and ironic antidotes against it. The film stumbles at times, but not so as to hurt itself, and the changes in tone are part of the film’s appeal. Beautifully designed and embellished with a fine score, Like Crazy keeps its most powerful moments for the end, when our investment in their stories delivers its payload.